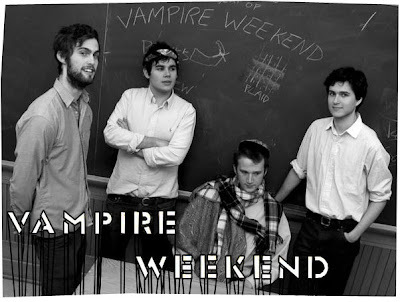 Let’s just start it this way; the first time I heard ‘Oxford Comma’ by Vampire Weekend, I never would’ve expected them to come about like the above picture (if you don’t believe me, listen to the song yourself). I thought they were composed of a couple of seasoned musicians, with a lot of years in their age whose come all the way from West Africa trying to pave their way and music into the American minds. I mean, how could it have been otherwise? Well, it could. Compared to all the stuffs I mentioned just now, the band instead comes across as 4 preppy freshly graduated (which is true) young men who are stuck in the 90’s (judged by what they wear) who’ll end up being earnest, dignified middle school teachers working in the local suburban area school – albeit good looking ones. Very good looking ones. 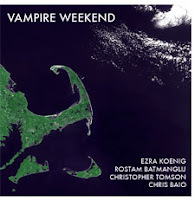 Vampire Weekend almost sounds like a black-metal rock band from Scandinavia, but guitarist Ezra Koenig insists that you see the name as a whole, and it’ll start to make sense. All these misleading misidentification can be mildly confusing not to mention slightly annoying but their music is something you can forgive them for. The band - that hails from New York, New York - have often described their sound as a “combination of West African guitar pop and New England preppiness” – now, I’m intrigued. ‘Oxford Comma’ is plainly a song about Oxford Commas as in the comma that comes before a conjunction in a list of three items. If you think that that makes them irrepressibly geeky, it is in fact that geekiness that makes their music so unbelievably approachable. The song is as charming as a bright warm summer day, infused with a mild infectious funked-up Afrobeat. It’s both a song that you can relax to and be amused by judged solely on its obscure whip-smart underlying tone. You should definitely listen.